Breakfast Bagels are soooooo delicious and super easy to make! Let me take you through how I made this yummy quick dish. 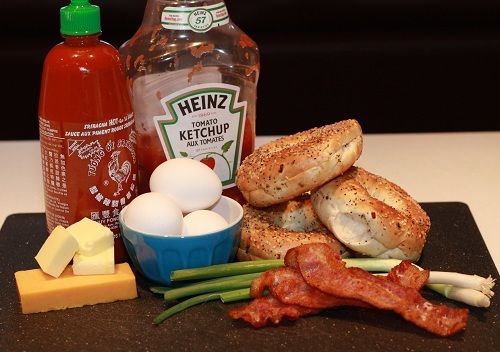 Ingredients you’re going to need: everything bagels, eggs, green onion, bacon, cheese, butter, ketchup and lastly sriracha. Okay so here we go, what you want to do first is fry up your bacon and save the little bits and also save a little bit of that bacon grease. This helps add flavor to your chopped green onions and eggs. 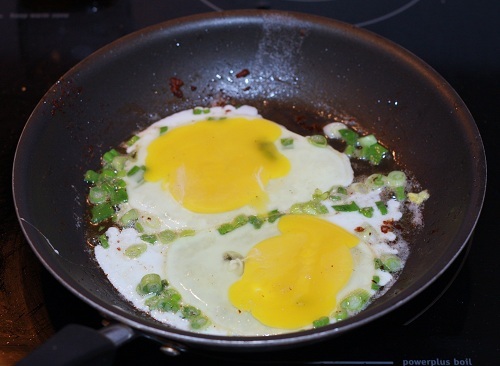 Once you cook up your green onions, lets say a minute on low to medium heat you want to add in a little butter and your eggs. Once you add your eggs make sure to break the yolk to make a nice fried egg. If you want, you could always do over easy for a gooey egg! Time to ASSEMBLE, the fun part! Toast your bagel, butter, then cut a few pieces of your favourite cheese. I like to use Old Sharp Cheddar so yummy! 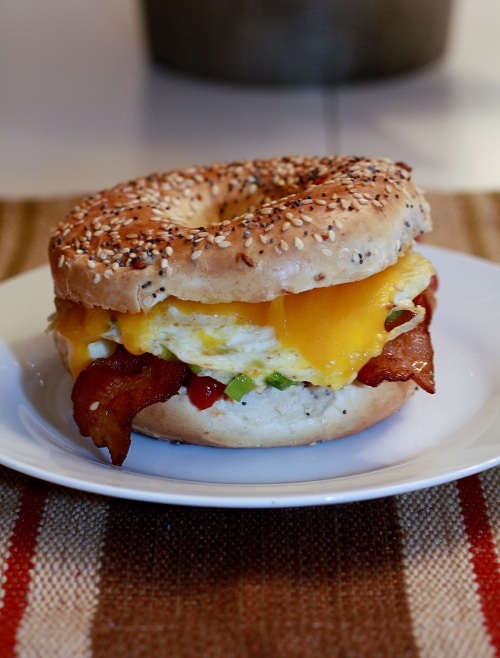 once you have topped your bagel with cheese, add your egg , bacon and then your other egg. Lastly top with the ketchup and sriracha or whatever hot sauce you have in the fridge, and there you have it! An amazing super easy, quick breakfast bagel. You can also turn your oven to 350 and pop your bagel inside to melt the cheese before adding egg and bacon. Cook bacon until no longer meaty, or to your desired preference. Save some of the remainder bacon grease to cook chopped green onions. Cook onions on low to medium heat for a couple mins or until fragrant. 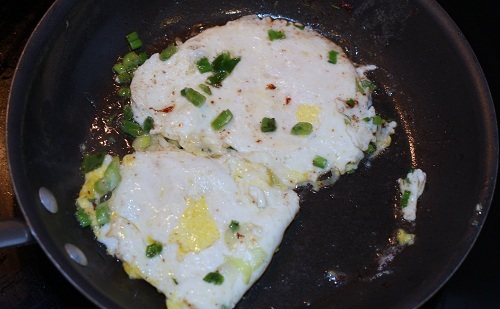 Now add your eggs to the pan with the onions, break yolk and do not flip until fully cooked. Wait a couple minutes then flip. Cook for an additional 2 minutes on other side. For over easy eggs, cook each side for not to long to make sure you don’t over cook your yolk, so you get that gooey center. Make sure to fully cook your whites. Toast bagel and butter both sides. Slice cheese, then add to bagel. Then top with egg, bacon and more egg! Lastly you want to top off your sandwich with ketchup and sriracha, or whatever topping you would like. You can also pop sandwich in the oven for a couple mins to melt the cheese, before adding bacon and egg. 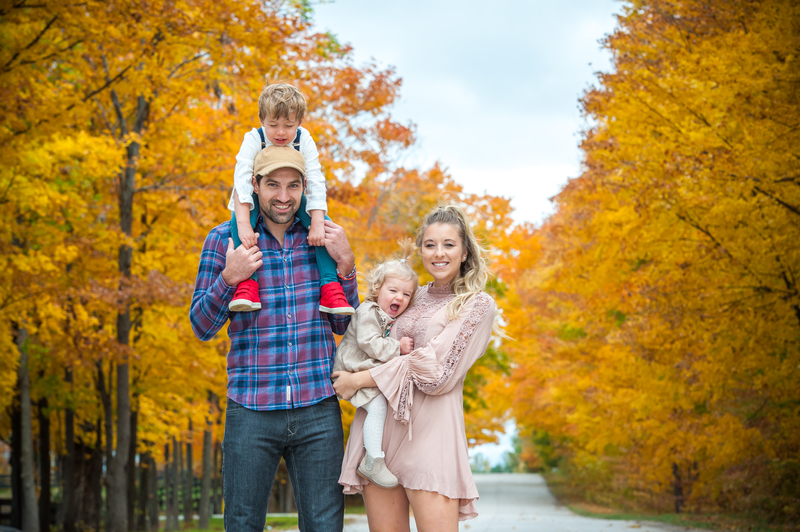 This entry was posted in Breakfast, Recipes and tagged Bagel, Breakfast, Breaky Sandwich, Delicious Bagel Breaky Sandwich, Egg Breakfast Sandwich, Sandwich. That looks amazing. I’ll definitely go ahead making a few of those. Pingback: 16 Great Breakfast Dishes for Company!